Puntos Necesarios: 4650 Tenga en cuenta que, de momento, no se puede descargar contenido de nuestra plataforma directamente en un dispositivo móvil (teléfono, iPod, iPad, tabletas ...). Necesitas descargar sus artículos en un PC o Mac y, a continuación, transferirlos a su dispositivo de forma normal. Estamos trabajando para permitir que las descargas directas a los dispositivos móviles, pero esto no es posible en la versión actual de la plataforma. Perdón por las molestias! Everyone listened to fairy tales about brave epic heroes in his childhood. Everyone dreamt of joining battle with terrible ugly monsters. 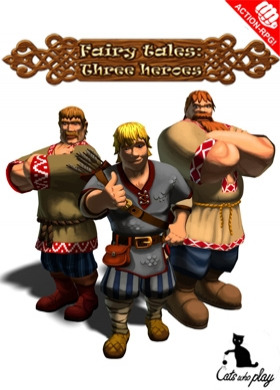 Everyone wished himself to be a magic hero…	And now you can bring back the memory of your childhood as there are three real heroes ready to cleanse Slavic lands from Monsters once and for all ! Features Three characters with unique skills (switchable at a… ny time) Ramified RPG skill-tree for each character Stylish cartoon graphics with bright effects Big levels with many optional quests Easy-to-learn gameplay Ingame physics directly affecting the gameplay A humorous Fighting Adventure based on Slavic eposes and characters	System Requirements : WindowsXP SP1 or Windows Vista. Pentium IV or AthlonXP or above. DirectX 9.0c (compatible video card with 128Mb video RAM PS/VS 2.0). RAM: XP 512 Mb/ Vista 1 Gb. HDD with 3GB free.